Ankylosing spondylitis (spondyloarthritis ankylopoetica, AS) is also known as Bechterew's disease or Strumpell-Lorrain disease. It is a progressive, chronic disease basically affecting the joints of the spine, sacroiliac joints and shoulder and hip joints . The main symptom is the stiffness of the spinal ligaments , which leads to the limited range of motion and the stiffening of the entire spine. The etiology of AS remains unknown. The incidence of this disease is believed to be influenced by the genetic and infective factors . It affects men three times more often than women, and it usually begins between 15 and 30 years of age. In women, the disease has milder symptoms, therefore it is rarely detected. The family history of the occurrence of disease is observed. Ankylosing spondylitis may also develop in children or in the elderly. Ankylosing spondylitis is a disease that starts slowly and progresses gradually . The symptoms that occur in the early stage of the disease , also called prodromal period or period of onset, include the general weakness of the body, the slight fever , the loss of appetite and the sudden weight loss. 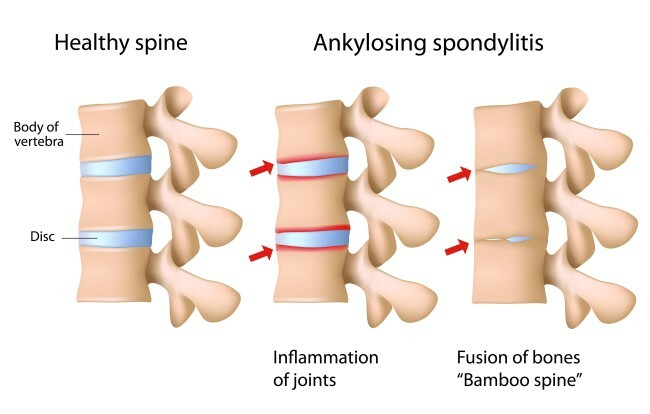 In the further stage , the characteristic symptoms of ankylosing spondylitis occur, such as morning stiffness, which may be accompanied by pain occurring symmetrically in the sacral segment of the spine and radiating to the lower limbs. This pain is described as dull, difficult to locate and persistent even at rest. When the costovertebral joints are affected, the rib pain can occur in the chest, especially during sneezing or coughing . In women, the disease often begins with pain in the area of the cervical spine . In the advanced stage the pain in the spine and chest worsens , and later the stiffness of the spine occurs. Pain symptoms may then become less severe. The entire stiffness of the spine leads to the situation where the patient wanting to look to the side needs to move the whole body around. Did you know that Hyalutidin HC Aktiv relieves joint inflammation occurring in RA? The course of the ankylosing spondylitis is characterized by the periods of remission and exacerbation. In addition to the emerging pain and restricted mobility there are other symptoms of ankylosing spondylitis , such as the loss of the physiological lumbar lordosis and alignment or deepening of thoracic kyphosis , resulting in lowering of the height of the patient. As a result of the deepening kyphosis there is a change in the setting of the shoulder blades relative to the trunk, thereby limiting a range of motion of the upper limbs .As the position of patients is increasingly bent, it makes them bend his head backward of the head in order to widen the field of view , leading to exacerbation of the cervical lordosis . Stiffening of the chest results in the decrease in lung capacity and the change of the breathing mode into the diaphragmatic one. The limitation of motion of the hip joints and pelvis causes the abnormal mode of walking . The disease process often affects the Achilles heel causing pain and impairing movement even more. This applies to approximately 40 % of patients. In the course of ankylosing spondylitis the changes in muscle tissue are also observed , which, along with the development of the disease, is being replaced by a connective tissue . This leads to the muscle weakness, and even their atrophy . The occurrence of a flexion contractures of hip, knee and ankle joints is also very common . Sometimes in the course of ankylosing spondylitis the disease process also affects other organs . In ¼ of patients the inflammation of the iris of the eye is observed, while the comorbid conditions of other organs include valvular heart disease , stimuli conduction disorder , inflammation of the aorta and the pericardium or lung fibrosis . In patients with ankylosing spondylitis the development of atherosclerosis and coronary heart disease is faster. As a result of changes arising in the course of ankylosing spondylitis, the spine of the patient is characterized by reduced flexibility, thus it is more susceptible to injury and more likely to develop osteoporosis. This may lead to the occurrence of instability or subluxations that can damage neural structures. The radiographic image of a patient with ankylosing spondylitis clearly shows the visible changes in the corpus vertebrae and the subluxation of the atlanto-axial joint in the cervical section of the spine. The interspinous ligaments and longitudinal ligaments are subject to ossification. Also, the formation of bone growths, called syndesmophyte, which connect the adjacent vertebrae is observed. The syndesmophytes originate in the annulus fibrosus. Depending on the location of the lesion, three forms of AS can be distinguished. The first one, called the axial spondyloarthritis, affects mainly the spine joints and sacroiliac joints. In the second type the hips and shoulder joints are affected . The third form of AS-called 'scandinavian' or “ peripheral" is characterized by the changes located in the joints of the spine, the sacroiliac joints and the joints of the hands and feet. This form occurs in approximately 25-30% of patients. The diagnosis is based on the clearly defined clinical and radiological criteria. The clinical criteria include the pain in the low back area lasting for 3 months, which decreases after exercise and subsides at rest, the limitation of motion in the lumbar section of the spine and the reduction of mobility of the chest. The radiological criterion is bilateral inflammatory changes in the sacroiliac joints of the grade 2-4 or unilateral changes of the grade 3-4. The diagnosis of ankylosing spondylitis is confirmed when both the radiological criterion and at least one clinical criterion is present. 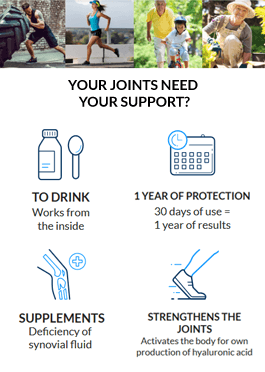 After a proper diagnosis of the disease, rehabilitation should immediately be begun and the daily diet should be changed in such a way that it would supply essential components for your joints. Regularity and compliance with the diet will certainly bring the expected results. It must be kept in mind that correct diagnosis is the key part of the treatment.